The Ibanez 2018 SR875 Electric Bass Guitar in Blue Reef Gradation is a 5-string that has it all. The sublime finish is matched by an elegant tonal output, and the exquisite playability is met by a resilient built quality. Whether you're jamming with friends, performing a gig, or recording in the studio, the SR875 suits any occasion. The SR875 inherits the comfortable SR series body shape, which combines a slender body depth comprising a slightly arched top that tapers off to gently bevelled edges. The result is a natural feel that accommodates players whether they prefer to wear their bass high or low, removing any obstacles so that you can get on with performing in comfort. The deep double-cutaway profile allows your hands to reach the upper frets with the greatest of ease. The body is crafted using mahogany, a tonewood that is favoured by many thanks to its impressive mid-range energy infused with rich warmth that permeates every note. Paired with this is a flamed maple and walnut top, which is finished in a heavenly blue reef gradation. Joined to the body is a durable five-piece jatoba/walnut neck, which has been fitted using an extended neck joint to aid in providing easier upper fret access. Shaped to the SR5 profile, the neck is designed to make it as comfortable to play as possible - even with the additional string. Married to the neck is a jatoba fingerboard, which is home to 24 medium-frets that are decorated with abalone oval position inlays to guide your way in style. The Ibanez SR875 is equipped with a pair of Bartolini BH-2 pickups, one in the neck position, and one in the bridge. The BH-2s translate the warmth of the tonewoods beautifully, whilst retaining a crisp clarity across every note to capture the subtle nuances of your performance faithfully. The SR875 is fitted with Ibanez Custom Electronics 3-Band EQ, which allows you to tailor your output to suit any musical style. The 3-way Mid frequency switch narrows the tonal focus, allowing you to zero in on the exact sound that you're looking for, and take full advantage of the extended range afforded by the additional string. Fitted to the body is the Accu-cast B505 bridge, which anchors each string securely whilst creating a seamless connection between the strings and body. Ibanez tuning machines uphold tuning integrity with absolute precision, no matter how aggressively you attack the strings. 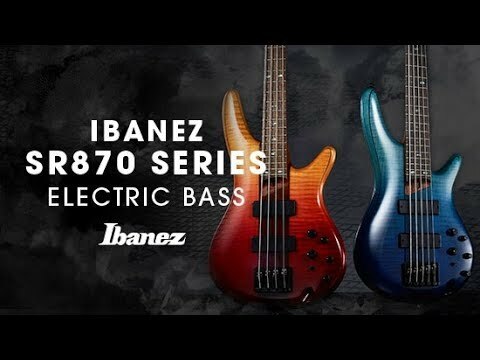 The Ibanez 2018 SR875 electric bass is perfect for bassists who want an adaptable workhorse that looks the business on stage.